The U.S. dollar stumbled on the news that the economy added fewer jobs than expected in August. The U.S. non farm payrolls (NFP) report showed only 151,000 positions versus the forecast of 180,000. Unemployment rate kept steady at 4.9 percent. The American currency was able to recover and finish the week ahead versus major pairs but the disappointing employment report puts a big dent on the chances of a rate hike in September. The U.S. Federal Reserve has been surprisingly hawkish about first the reduction of global risk and second about the pace of growth of the U.S. economy. The speech by Fed Chair Janet Yellen at Jackson hole put the September Federal Open Market Committee (FOMC) rate hike firmly in play, but as I mentioned earlier the next line was “Of course, our decisions always depend on the degree to which incoming data continues to confirm the Committee’s outlook.” The soft jobs report will not derail the Fed’s outlook but could now leave the fate of the next Fed rate hike up to the inflation and retail sales numbers in the middle of September. The central bank calendar for the week of September 5 to 9 will bring into action the Reserve Bank of Australia (RBA) on Tuesday, September 6 at 12:30 am EDT. The Bank of Canada (BoC) on Wednesday, September 7 at 10:00 am EDT and the European Central Bank (ECB) on Thursday, September 8 at 7:45 am EDT. The RBA and the BoC are expected to leave rates unchanged with the only interventions being rhetoric from central bankers. The ECB is facing a bond buying challenge and might replicate the Bank of Japan (BOJ) strategy and purchase stocks, but it is not as straight forward for the central bank headed by Mario Draghi. Updates to the ECB’s forecasts and quantitive easing program are on the table but it is expected the central bank will stick to verbal easing as much as possible. The EUR/USD lost 0.642 percent in the last week. 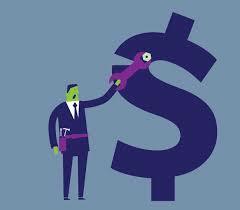 The single currency is trading at $1.1160 as the rally from earlier in the week boosted the USD. The underperforming NFP only sapped some momentum from the direction of the move, but the USD managed to appreciate on a daily and weekly basis versus the EUR. Investors were not that convinced the Fed will hike in September even before the NFP report was published. 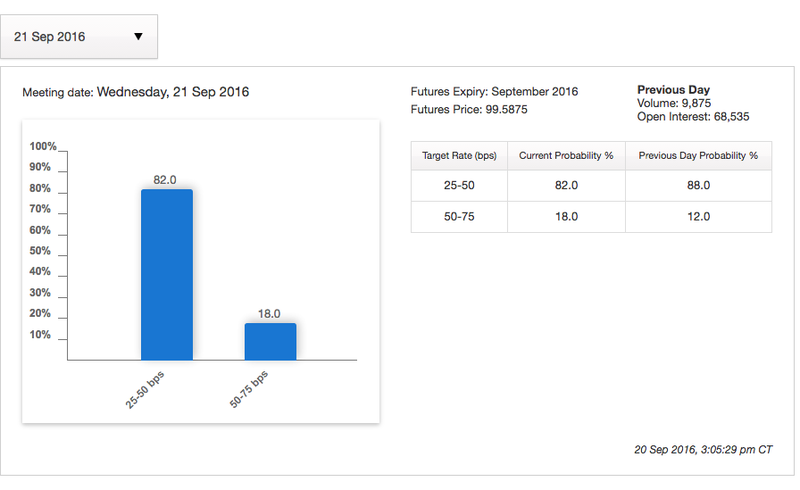 the CME’s FedWatch tool pointed to a 24 percent probability of a rate hike yesterday and that went down to 21 percent after the release of the jobs report. Economists and analysts are divided on how much a strong or weak jobs report could determine the fate of the anticipated rate hike from the Fed. Allianz’s Mohamed El-Erian sees a 60 percent chance of a rate hike that could have gone up to 80 percent if the NFP had been stronger. The market is pricing in at least one rate hike in 2016, with the timing with the highest probability being the December FOMC. The biggest strike against a September move is not the health of the U.S. economy or the impact of a rate hike on the markets but rather the proximity to the presidential elections. The Fed is in no rush to hike and the token 25 basis points interest rate change will hardly shake the markets which could prompt the central bank to wait, once again for December to deliver the goods. West Texas dropped 5.82 percent in the last 5 days. The price of oil was erratic in the last week of August as concerns with overproduction, stronger U.S. dollar and lower global growth forecasts combined against the lukewarm efforts of the Organization of the Petroleum Exporting Countries (OPEC) to bring down the price of oil. WTI is trading at $44.07. Only the NFP stumble of the dollar is keeping above weekly lows of $42.90 as the black stuff was one of the biggest winners of the August job report underperformance. The OPEC meeting in September could not come at a better time for producers as oil is close to erasing all the gains from the month of August. The oil output freeze talk has kept crude bid, but the failure of the March Doha agreement does not give a lot of confidence to investors that this time around OPEC and non-OPEC members will cap production levels. Even if they managed to agree, there is still the fact that they would do so at record high production levels and with moderate demand at best a supply glut would still put downward pressure on oil prices ahead of winter.